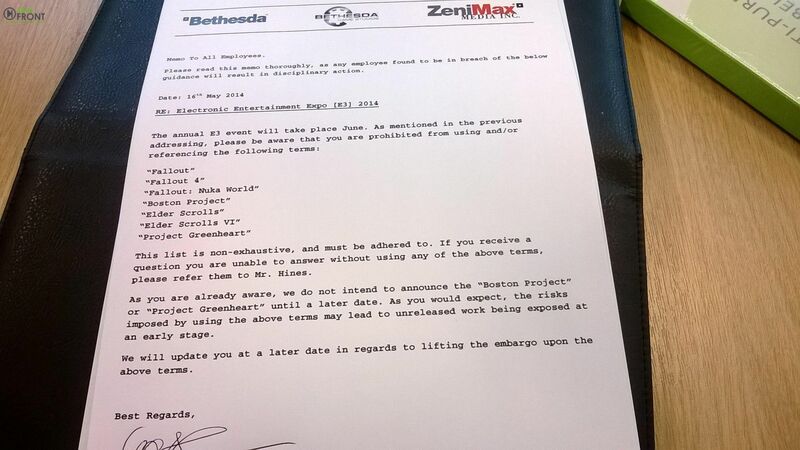 There's this interesting Bethesda memo floating around. Maybe you've seen it on a fan-run gaming site or your favorite message board. It's all very exciting. In the memo, which started circulating last week, a reputed Bethesda executive writes to employees about exciting upcoming games like "Fallout 4" and "Elder Scrolls VI." The executive also drops some neat titles like "Project Greenheart" and "Fallout: Nuka World." Cool stuff, sure to excite some people who like all the great role-playing games made by Bethesda Game Studios. There's just one problem—nobody at Bethesda wrote that memo. It's a fake. In fact, Kotaku has learned that the person behind this memo is also responsible for making up a number of popular rumors over the past few months and years, including "Call of Duty: Patriots" and a list of fake Watch Dogs achievements that made the rounds last fall. These weren't small-scale rumors, either—major gaming outlets like GameSpot, VG247, and CVG have all picked up on the tips created by this guy. The rumor-monger agreed to speak to me under condition of anonymity, calling himself "Jesse" and taking responsibility for many of the sillier rumors that have floated around recently, some of which have spread further than others. "I've been doing it for a few years now, and this is the first time that I've actually spoken about it," he said in an e-mail. "I tend to plan ahead a little and time things appropriately. Timing really is what makes or breaks a rumor." Take that Call of Duty story, for example. Last month, Jesse made an account on the community website Bubblews.com, where he made up a bunch of details—in convenient bullet-point form—about what he said would be the next Call of Duty game. Though it was all fake, the rumor was picked up and echoed by a number of major message boards and gaming websites—partially because of the timing. "Everybody knows that Activision announces Call of Duty around May time, so earlier this year I planned to get the rumor out there in April," Jesse said. "Which worked." Jesse also takes responsibility for exacerbating fake rumors in 2013 that Bethesda had "secretly" shown the next Fallout game to journalists at E3. He says he saw people speculating after a couple of vague tweets and decided to fuel the flames by writing another Bubblews.com post about clandestine meetings in Los Angeles. 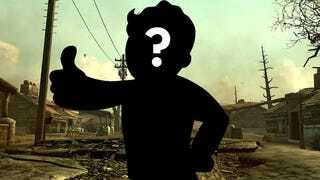 Fans, hungry for Fallout 4 news, helped spread the rumor quickly. "Generally, most people on the internet are gullible, and fall for most things," Jesse said. "This is how I get rumors to spread. All it takes is one person to see it, believe it, and tell his friends. Some of his friends believe it, and they tell all their friends. Before you know it, it goes viral." There are a couple of things worth pointing out in that second image. For one, it's shot at an angle, which is almost always a sign that a rumor is fake. Jesse also made sure that the name on the bottom was cropped out, because it's pretty easy to google "Christian DeLonge" and figure out that there's no person with that name at Bethesda. What's particularly amazing is how easy it's been for Jesse to get his schemes picked up and spread by video game websites both big and small. With nothing but an e-mail tip or a post on Bubblews.com, Jesse can get his rumors passed along to thousands of people. The power of the Internet. "Even within minutes of posting nonsense, you'll get hits," Jesse told me. "I then have a false account tweet a link or two, occasionally use the false Facebook account to post on a few people's walls. From there, if it's plausible, it spreads and gets picked up by small sites. At this point Google picks it up as one of the first results. If you searched 'Fallout 4' right now, within the first page are several references to the memo." Jesse is a big Bethesda fan—while speaking with me he used the handle "Pete sHines," a reference to Bethesda vice president of marketing Pete Hines—but he's also made up a number of fake lists for non-Bethesda games like Dead Rising 3 and Watch Dogs. A list of fake Watch Dogs achievements he published in August of 2013 somehow circulated again last month, popping up on major gaming websites like CVG, Official Xbox Magazine, and VG247 before Ubisoft told reporters it was fake. It's also worth noting: not every Fallout 4 rumor on the web has come from Jesse. Last year's Survivor2299 hoax was crafted by someone else—"That was one of the best hoaxes I have ever seen," Jesse told me—and we made sure to verify those Fallout 4 casting documents we published back in December, which we believe are real. Watch_Dogs 2 Announced! Named Vegas & To Be Released In 2015! A source close to the PR team at Ubisoft has leaked a confirmation that they are planning to announce a new Watch Dogs game imminently. Although we can't say for sure when this official announcement will come, it's sure to be within the next few weeks. > It will not be called Watch Dogs 2, it's official release will be "Watch_Dogs: Vegas". > The setting is a version of Las Vegas set a few years after the events in Chicago. > You will not be playing as Aiden Pearce, the main protagonist of the game is named Thomas Simmons. > There will only be a release on PS4, Xbox One & PC – No Xbox 360, PS3 or WiiU version. > If you have a completed save file from the first game, you may load the data into Watch_Dogs: Vegas. This will have an effect on your game. This has been internally referred to as the G.A.D System (Game Altering Dynamics). > The game will run on a newer version of the Disrupt Engine. > Scheduled to be released in 2015, the game allegedly began development in 2013. The details we have are scarce, but keep an eye out in the coming days and/or weeks for the official announcement from Ubisoft. Are you ready to start a new hacking adventure in the streets of Vegas? We know we are! He's also planning on starting more ridiculous scuttlebutt in the future. "As you would expect I have rumors planned, but I don't have anything going out until the end of the year," Jesse said. "All it takes is a little effort and some clever wording, and you have your own rumor. As long as something in there is plausible, sites will pick it up." He says it's easier to get smaller, fan-run websites to pick this stuff up, and that once they do, the rumors will start making their way up the food chain to bigger, professional gaming outlets. Though Bubblews.com claims to pay for traffic on their articles, Jesse told me he hasn't made a cent from the website, partly because he uses fake information, and partly because he "[doesn't] really need a few dollars from some poxy little site." So why does he do this? What's the rationale behind fooling people on the Internet, spreading misinformation and getting fans excited over nothing? "I do it all just because I personally find it entertaining," Jesse said. "Got to do something to keep the boredom away."